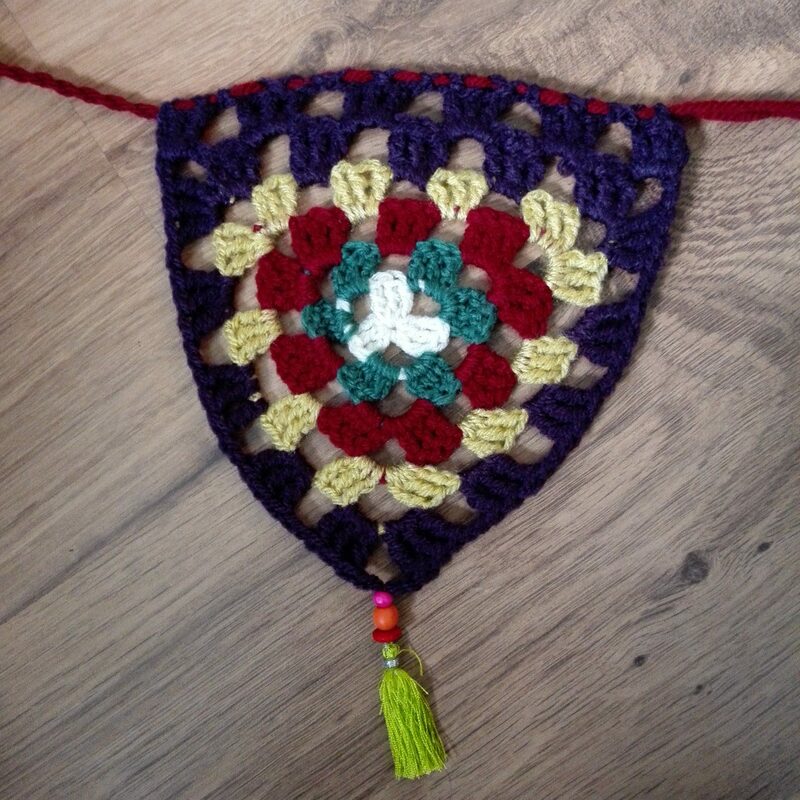 I’m busy crocheting bunting for this Dutch project, which aims to break the Guiness World Record for handmade bunting. They aim to make 10km of bunting (which is 40,000 flags!). At the end of the project, the bunting will be sold and the proceeds will go towards helping people with cancer and their relatives. The flags need to be at least 19cm at the top and less than 20cm tall, Since I couldn’t find the perfect granny pattern, I decided to make my own :). If you want the flag to be taller or wider, you can add an extra row to the top (just do an extra row by repeating 3tr, 2ch). I also put a little tassel and some wooden beads at the bottom to make them look extra festive. I have also designed some some more bunting patterns that work up quickly, so be sure to follow me on facebook so you don’t miss any of them! I used a 3.5mm hook and acrylic yarn. 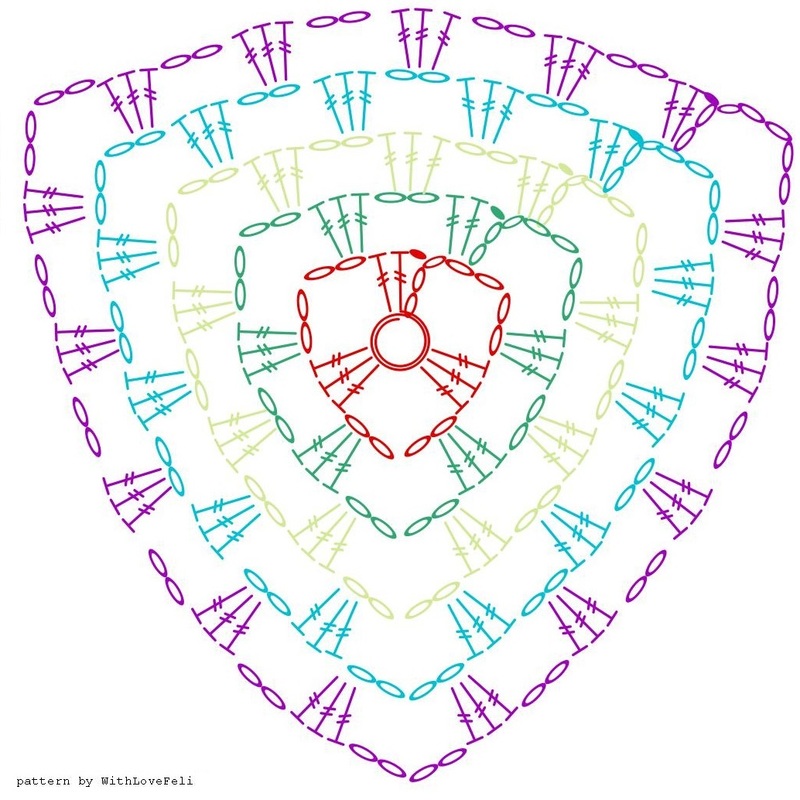 With bunting I find patterns with symbols way easier than written patterns, so here’s my graph. As you can see, it’s made out of groups of 3 treble crochet with chains in between. Those chains create “holes” in the bunting, which is where you put your hook through when making the next row. Six “sets” of 3 treble crochet are 4 arm lengths of yarn when you work with a 3.5mm crochet hooks. This is the legend for the symbols used. For anyone who doesn’t use US terms: the ‘tr’ in the legend is called ‘dtr’ in the UK and ‘dubbel stokje’ in Dutch. 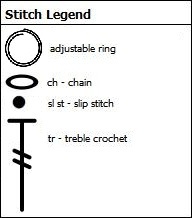 If you do not know the adjustable/magic ring, you can also start with a little circle made with (ch4, slst in first ch) and work the stitches in there. This will leave a little hole in the middle, so it’s just personal preference. Good luck making the bunting and don’t hesitate to ask any questions you may have!